We Hope This List of the Best Tennis Betting Sites Serves You Well! 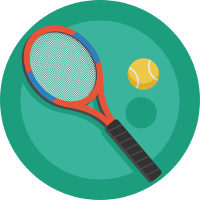 Tennis has been around since the 19th century, and it’s played by everyone from children to Olympic athletes. The rules have stayed the same for over a century, allowing both casual fans and sports bettors to easily follow the on-court action. All major sportsbooks offer Tennis betting and its appeal stretches to every corner of the globe. If you’re looking to join the legion of gamblers who regularly bet on this racquet-based sport, the items included in this article should help get you started. If you’re going to bet on tennis, you need to be aware of the four annual Grand Slam tournaments. These competitions are the most-watched events in the sport, and they offer the biggest prize money, the most competition, and the highest television ratings. Founded in 1905, this event is held at Melbourne Park in Australia and played on a hardcourt surface. Held at the Stade Roland Garros in Paris, France, this tournament has been around since 1891 and serves as the most significant clay court championship in the world. Established in 1877, this event is held at London’s All England Lawn Tennis and Croquet Club. It is the only major still played on a grass surface. This annual hardcourt event is the modern incarnation of the U.S. National Championship, which traces its roots back to 1881. The bettor attempts to predict the winner of a specific set, often the first of the match. In order to receive a payout, the bettor must accurately predict the winner of an upcoming tournament. As these wagers are often listed months in advance—with odds changing as the event draws closer—this form of bet falls under the “futures” category. The bettor picks the winner of an upcoming match. The money line style of betting is often used, with each player being assigned a number and either a plus or minus sign (Example: Serena Williams -320 vs Caroline Wozniacki +225). The player with the negative sign is the favorite, and the number indicates how much the bettor needs to wager in order to win $100. The player with the plus sign is the underdog, and their number indicates the amount won if successfully risking $100. The oddsmaker predicts the total number of sets to be played in a match. The bettor must then decide if the actual number will be higher or lower. The bettor is asked to choose the total number of games in a set from among a list of options. These wagers can take several forms, but their defining characteristic is that they occur while the match is actually underway. In tennis, the favorite often has 1.5 sets deducted, while the underdog gets 1.5 sets added to their final tally. This adjusted finish determines the winner. A money line is sometimes used in conjunction with this wager to determine the amount of the payout. The bettor must predict the outcome of a specific event or situation. Examples might include the number of faults hit by a player in a match, the number of tournament wins by a player in a season, or the combined number of aces during a set. In this section, we’ll provide a few tips for both beginning and intermediate tennis bettors to help you get the most out of your experience. One player might be excellent on clay, but they traditionally struggle on the hardcourt. Learn how each player performs on all possible surfaces (grass, hardcourt, clay). Nagging injuries can hamper even the most talented player. Pay close attention to the physical health of player, because the oddsmakers certainly are. Each player has their own style of play, with some excelling at big serves or long volleys. Before a match, see how a player has performed against opponents with a skillset similar to their current competition. This may provide a preview of how the match will play out. Some players are better in windy or adverse conditions. By knowing the tendencies of players, you can capitalize when less-than-ideal weather occurs.